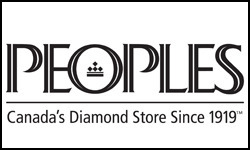 Founded in 1919, Peoples Jewellers has become Canada's diamond store. Exclusively at Peoples, you can now find the Celebration Canadian Diamond™ - with 100 facets. With a focus on providing affordable fine jewellery, Peoples also provides affordable interest-free credit payment plans, lifetime extended warranties, 100-day refund policy and knowledgeable DCA certified jewellery consultants to elevate your shopping experience. From engagement rings to titanium men' jewellery, you'll be sure to find the perfect jewel at Peoples! Shop exceptional fine jewellery and diamonds today at CF Fairview Park in Kitchener.